Year round comfort awaits you with our 5 Piece Bedding Set. This bed in a bag set will add a touch of warmth and it will create a calm and relaxed atmosphere for your bedroom. 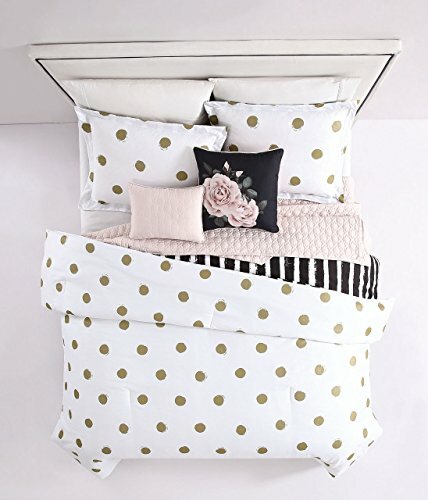 Comforter sets are designed to keep you updated and fashionable in the most convenient and inexpensive way. 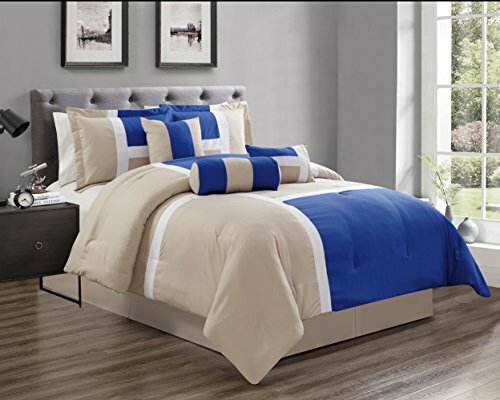 Our comforter sets are a tremendous blend of bold and vibrant colors. They can transform a room from bleak to bright and cheery in a matter of minutes. Our comforter set will have your bedroom decorated with style. Turn your home into a haven with our beautiful comforter collection. Our comforters come in many sizes, including king comforters, Twin comforters, and even California King comforter sets. We've included everything you need to make over your bedroom such as comforter, pillow shams, and bed skirts. 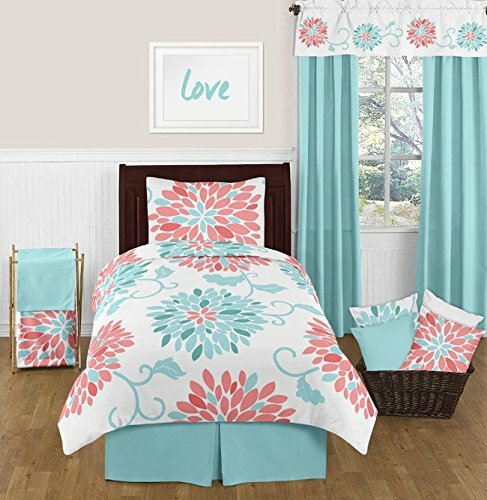 Comforter sets are comfortable, durable and beautiful. Our comforter sets are designed for year around comfort. Add a fresh touch of charm to your bedroom or guest room with the Emma Collection. This three-piece quilt- and-shams ensemble looks beautiful with any decor, and it's lightweight warmth is perfect for all seasons. The Emma Collection makes a great gift for weddings, birthdays, and anniversaries, too!Benefits - Durable polyester-cotton blend filling designed for all-season use - Lightweight warmth and comfort - Includes 2 bonus shams (1 bonus sham for Twin size) - Affordable prices that fit any budget, without sacrificing quality - Beautiful floral printed pattern to enhance any decor - Perfect gift for birthdays, weddings and morePerfect Fit Sizes and Modern Colors - Twin Quilt: 66 inches W x 90 inches L; Sham: 20 inches W x 30 inches L - Full/Queen Quilt: 90 inches W x 90 inches W; Shams: 20 inches W x 30 inches L - King Quilt: 108 inches W x 90 inches L; Shams: 20 inches W x 40 inches LEasy Care Machine washable warm, tumble dry low, warm iron if needed. Designed to last.100% Satisfaction Guaranteed! If you don't absolutely love this product, return it within 30 days for a full refund. We'll work with you to resolve any issue and ensure that you're satisfied with your experience. 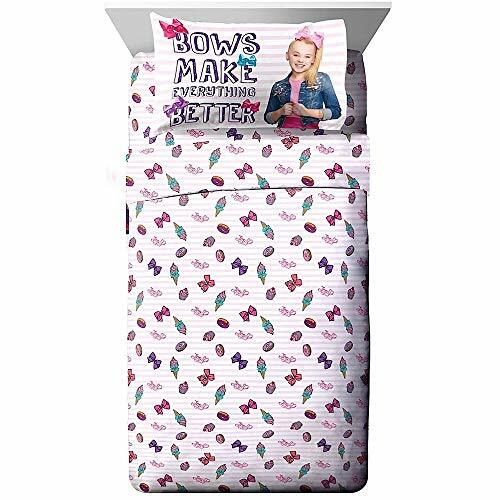 Jojo Siwa twin sheet set for kids. Durable and soft microfiber material for bed time comfort. Bows, cupcakes and donut pattern. Bright bedding for toddler or children's room. Add a comforter, throw blanket and pillow for a complete children's bedding set. Machine wash cold, tumble dry low. 100% polyester. Intertwining rings of pink, blue, and green set a beautiful contrast atop the crisp white ground of the Emma's Wedding Ring quilt set. Trimmed with a scalloped edge and embellished with vermicelli quilting, this quilt reverses to solid white for additional styling options. Crafted with a 100-percent cotton facing and a soft microfiber backing, Emma's Wedding Ring has a polyester/cotton blend filling for loftiness. 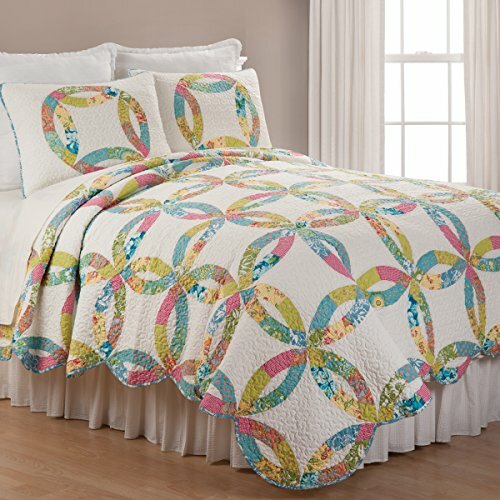 This quilt set is machine washable for easy care. Coordinating euro shams, accent pillows and bed skirt available separately.